There have been many engaging biographies published in recent years. One of the major units that I share with our Fourth Graders is entitled “People Who Make a Difference.” We read picture book biographies about athletes, artists, statesmen, activists, and others who forged the way for civil rights and human rights. I want to share this post that I originally wrote in 2012 because it is still so timely. The students were especially interested to learn about Jacques Cousteau. While I grew up watching National Geographic specials that Cousteau had produced (and singing John Denver’s song, “Calypso”), few children today know about Cousteau and his work. 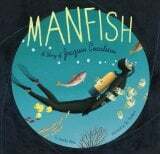 Manfish: a story of Jacques Cousteau by Jennifer Berne, illustrated by Eric Puybaret (Chronicle, 2008) introduces young readers to this icon by depicting him as a young boy with a love of the ocean and cameras. The author captivates young readers as she introduces Cousteau’s inventions and experiences like the aqualung and other scuba gear, the use of underwater cameras, the diving saucer, and the sea flea. In The Fantastic Undersea Life of Jacques Cousteau by Dan Yaccarino (Knopf Books for Young Readers, 2009), the author/illustrator inserts short quotes by Cousteau as he chronicles the adventurer’s life. Here’s a video on Jacques Cousteau’s work with John Denver’s song “Calypso”.